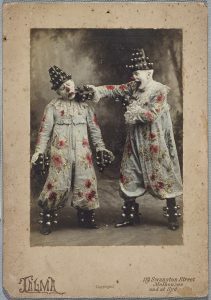 Jandaschewsky Clowns, 1903. Image by Talma & Co. Collection: Museum of Applied Arts and Sciences, Sydney. Is modernism funny? During the late nineteenth and early twentieth centuries Sigmund Freud theorized jokes and their relation to the unconscious, while Henri Bergson argued that laughter is produced by “something mechanical encrusted on the living.” English literary modernists held Victorian earnestness in contempt, often while taking themselves extremely seriously. Early twentieth-century Dadaists committed themselves to nonsense and irrationality and, in 1940, the surrealist André Breton edited and published an anthology of “black humour.” The late nineteenth and early twentieth centuries also saw the rise of popular and parodic forms of comedy and humour such as the comic strip, vaudeville, camp, and Buster Keaton’s deadpan acting style. These comic forms and styles were bound up with histories of immigration, gender and sexuality, race, technology, and culture industries. Humanities scholars are devoting new attention to the aesthetics, politics, and social significance of comedy and humour. For instance, in their 2017 special issue of Critical Inquiry on comedy, Lauren Berlant and Sianne Ngai note competing trajectories of modern social life: on the one hand, “people are increasingly supposed to be funny all the time,” and on the other, “humourlessness is on the rise.” In the same issue, Ngai opposes the labor-saving operations of the “gimmick” to Victor Shklovsky and Bertolt Brecht’s practices of making methods of production visible. These tensions and oppositions suggest the usefulness of attending to comedy and humour in the field of modernist studies, which in recent years has rethought traditional oppositions among popular, high modernist, and avant-garde cultural forms. We invite papers that engage with comedy and humour across the interdisciplinary field of modernist studies. How do comedy and humour reflect and affect the geographical, temporal, and cultural expansiveness of contemporary modernist studies, and what might Australasian scholarship contribute to this expansion? When are comic genres and styles normative, subversive, or ambivalent? When is laughter a mode of detachment, and when is it a way of being in relation? Who is in on the joke, and why does it matter? Please send an abstract of no more than 300 words and a bio of no more than 150 words to modernistcomedy@gmail.com as an attachment by March 30th 2018. Confirmed keynote speaker: Professor Nick Salvato (Cornell). This speaker is supported by the ARC Centre of Excellence for the History of Emotions. Bursaries of up to $200 will be awarded on a competitive basis. Bursary recipients will also receive free conference registration. Candidates should be enrolled in, or recently graduated from a higher degree research program and have had an abstract accepted for the conference. Expressions of interest will be solicited after acceptances have been announced. Questions may be directed to sarah.balkin@unimelb.edu.au.